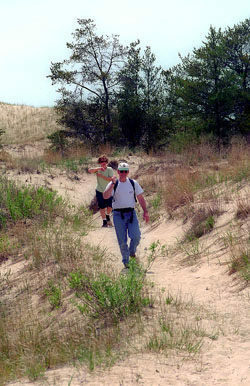 The toughest climb for many hiking at Ludington State Park isn't a knee-bending ridge or trudging through the soft sand on a steep dune. It’s the 130 steps to the top of the Big Sable Point Lighthouse. They often reach the historic building late in the afternoon, entered its 112-foot tower and looked up at a tight spiral staircase to see a stairway to heaven. It’s all part of the lighthouse experience at Ludington State Park. By walking out to the former light station you get a sense of the isolation that the lightkeeper would have felt. The fact that you can't drive to the lighthouse doesn't stop 20,000 people annually from enjoying the splendid views from its tower and the natural beauty of its setting. The vast majority of visitors reach the structure with a 3-mile, round-trip walk along a rough dirt road closed to motorized traffic. That's ironic, because in this park of spectacular hiking, the road is by far the most unappealing route to the lighthouse. 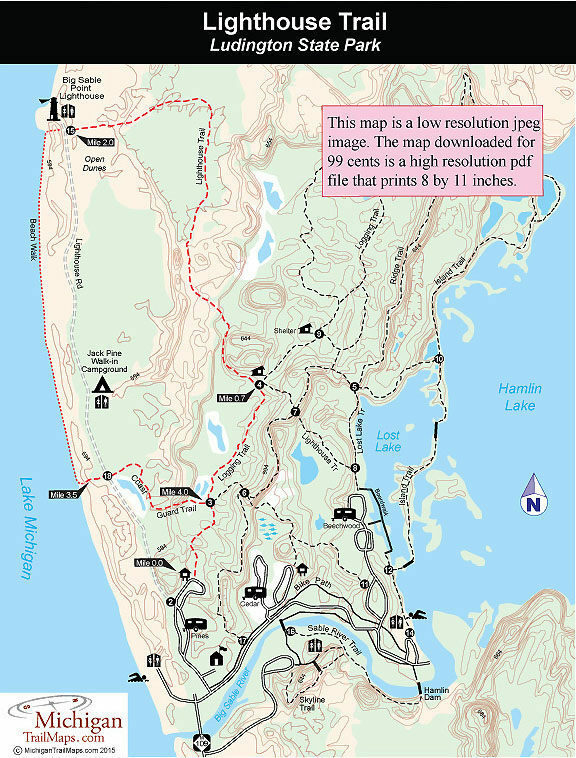 Ludington State Park is laced by more than 20 miles of hiking trails that wind over forested ridges, across open dunes and along the secluded bays of Hamlin Lake. This route, a 4.3-mile loop out of the Pines Campground, offers what the park is renowned for: sandy dunes, a stretch of undeveloped Lake Michigan shoreline and a lighthouse that has changed little since it was built in the late 1800s. Pines Campground serves as the trailhead for the Logging Trail and the start of the Lighthouse Road, a service drive that is closed to motorized vehicles. The Logging Trail is posted next to site No. 41 and looks like the old logging trail that it once was. You immediately climb a ridge that is forested in pines and hardwoods and within 0.3 mile descends to a small wetland and post No. 3, marking the junction with the Coast Guard Trail. Stay with the Logging Trail, marked in green arrows, as it heads northwest. At Mile 0.7 you arrive at a stone shelter built in the 1930s by the Civilian Conservation Corps, now a scenic spot to sit out a sudden rainstorm. Just beyond it is post No. 4, marking the junction of the Lighthouse Trail. Head left to follow the brown arrows that mark it. The Lighthouse Trail begins in the forest but with a sharp climb quickly emerges out of the hardwoods and pines and onto a ridge of open and grass-covered dunes. If the day is not too hot, it’s a welcome change of scenery that lasts for almost a half mile before the trail descends back into scruffy pines. After a small dune provides the first glimpse of the lighthouse, the trail swings left at Mile 1.6 to reach a posted map. At this point the Lighthouse Trail heads almost due west and in the next half mile winds around interdunal ponds and over dunes. It’s not so much a trail but more like a series of foot prints in the open sand with an occasional trail marker. It’s hard to get lost, however. 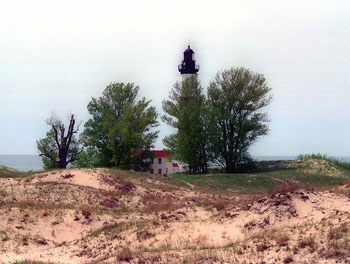 The distinctive black-and-white tower of the Big Sable Point House soon appears above the rolling dunes, showing the way like the guiding light it was built to be for sailors of the Great Lakes. At Mile 2 is post No. 15 on the Lighthouse Road, with the lighthouse just to the north along with picnic tables and restrooms. The Big Sable Point Light Station was built in 1867 and included the tower, quarters for the keepers and their families and a fog horn building. It was originally outfitted with a third order Frensel lens that was almost six feet tall and could magnify the light of an oil lamp 18 miles out into Lake Michigan. The lighthouse is one of the most northern points of the park's trail system, making it an ideal spot for an extended break or lunch. On the first floor the Association maintains an interpretive room and a gift shop that does a brisk business selling bottles of water and soda on hot summer days. But most hikers who arrive have one thing in mind. They want to climb the tower, 130 steps and all. And for good reason. The 360-degree view from the top is spectacular. And what is most amazing about the view is that it hasn't changed since the first lightkeeper arrived in 1867 and scaled the tower. Because the lighthouse is surrounded by state land, it looks exactly as it did 144 years ago. That alone makes it worth the hike in. There are two ways to return to Pines Campground. The Lighthouse Road is a 1.5-mile walk back and skirts the forest to the east and the open dunes to the west. Along the way you pass a number of ponds and wetlands and within a mile is the Jack Pine Walk-in Campground, which has 10 sites, vault toilets and drinking water. You can also follow the beach back, a far more interesting trek. The shoreline is wide and sandy scattered with driftwood. You can stroll along the hard sand near the water with Lake Michigan’s surf pounding one side and low, rolling dunes on the other. At Mile 3.5, there is a depression between two dunes and a trail post with a black arrow, marking the west end of the Coast Guard Trail. Follow the Coast Guard Trail and at Mile 4 arrive at post No. 3, marking its junction with the Logging Trail. Head south on the Logging Trail to retrace your steps to Pines Campground, reached at Mile 4.3.